So I recently decided to update my aging system. I was running: i7 4790K with 32gb of Corsair Vengeance 32GB DDR3 2400MHZ ram with a Nvidia 970 GTX. These will be installed into my current Thermaltake CHASER A71 Full ATX case with my EVGA GTX 970 and various other peripherals. This wasn’t my cleanest build but I am happy. 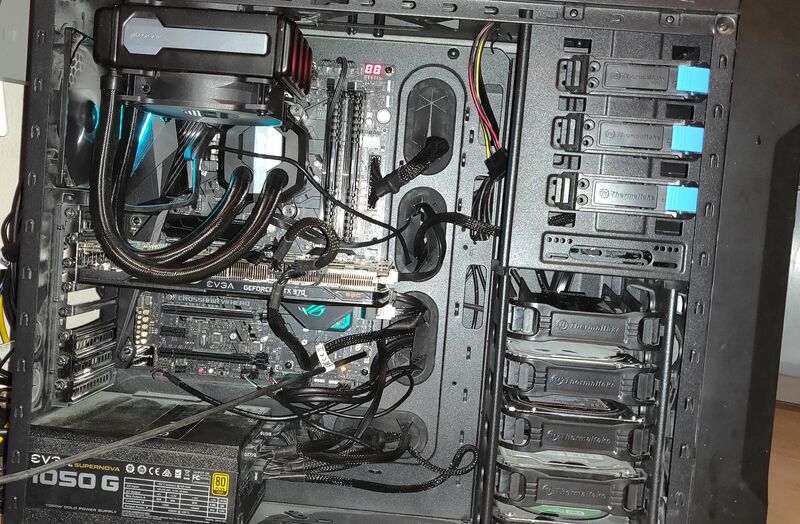 (Yes, the top of the PSU is dusty and I just cleaned it). Thanks, I like it a lot. Did you have NVME on the old system or did you reuse your SSD? Edited by raymac46, 04 November 2018 - 08:41 AM. Did you have MVME on the old system or did you reuse your SSD? I reused all of my harddrives. I literally didn't have to do anything with the software side of things. I fiddled with the new bios but it was trying to boot archlinux out of the box and that is with 6 harddrives to choose from... 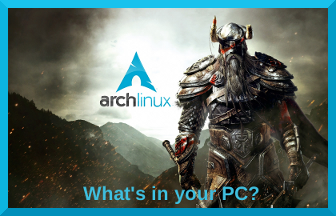 It's been a few years since you had to reinstall Linux when you switched motherboards and processors. Usually, it sees everything perfectly. ****, Windows cannot do that..even with WIn 10's autodetection. Neat build. Nice to see that AMD have finally got on top of their cpu heat and power usage problem. I have thought about my next Linux build and I think I'd go with one of those Ryzen 2 APUs. That's what I did last time - chose an APU and added in a cheap GPU later. They are "only" quad-core but I'm not rendering video or anything like that - not even PC gaming. At present my old Trinity based Piledriver APU is still chugging along and does fine for watching YouTube, surfing the net, office work and blogging. The only reason I added a GPU was that AMD didn't support the older APU graphics as well. I want to wait until all the BIOS glitches are fixed on the motherboards though. Some of the older mobos didn't support the Ryzen 2 chips without an update. I could reuse my GPU but if I had a powerful Ryzen CPU I'm sure it would be bottlenecked. The only Ryzen CPUs with onboard video are the 2200 and 2400 series. Most Ryzen 2 chips do not come with onboard video. AMD always confuses me with their numbering. The APUs are 2XXX although based on Ryzen 1 architecture. I'm sure they'll get around to an upgrade to Ryzen 2 eventually. Ryzen 5 2400G would suit me I think. Edited by raymac46, 04 November 2018 - 11:25 AM. Edited by mhbell, 11 November 2018 - 11:49 PM. Well I do not game very much but I need the power for my workflow.. I already had the video card. Have you checked the power consumption? I'd be surprised if you come anywhere near even half the capacity of your PS. I have a Corsair 750i which has inbuilt monitoring via Corsair Link software. After some solid gaming sessions I checked it and peak was about 250W (1/3 of capacity). My graphics card is same as yours but there are several less HDs. Oh I know that my PSU is an overkill but I figured why not go big? After all, I do have 8 harddrives and six monitors attached to this computer along with some usb hubs with various peripherals attached. This way, I will never have to worry about power consumption. 19 minutes battery before automatic shutdown (using pwrstatd to cleanly shutdown with email notifications).